I know, I know. I know what you all are thinking… I deserve “most inconsistent blogger of the year award”. Yep! I won’t even go in to the layers of craziness that have been my life lately! But thankfully, circumstances are stabilizing. *Deep sigh*. I want to share pictures of the wonderful time we had this weekend, doing one of our favorite things together… playing in the garden! According to the Biodynamic Planting Calendar, yesterday and today are perfect times for planting root vegetables- and the weather was also incredibly nice. 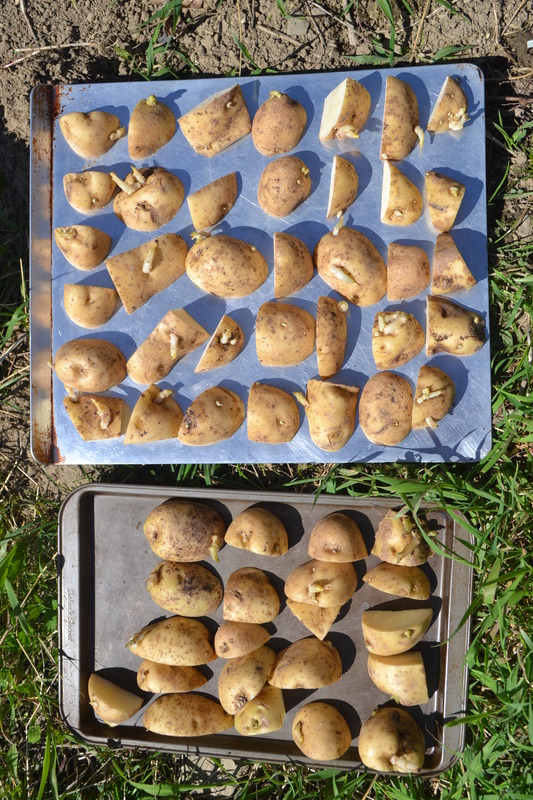 So we cut some already sprouting potatoes from the root cellar into pieces (I like to make sure there are at least two “eyes” per piece).